The New York-New York Hotel and Casino resembles a Broadway stage set more so than a 2,000-room hotel. One of many themed hotel and casinos on the Las Vega Strip, this hotel’s architecture is meant to evoke the skyline of New York City during the 1940s. Set back from Las Vegas Boulevard are the recognizable Empire State and Chrysler Buildings. 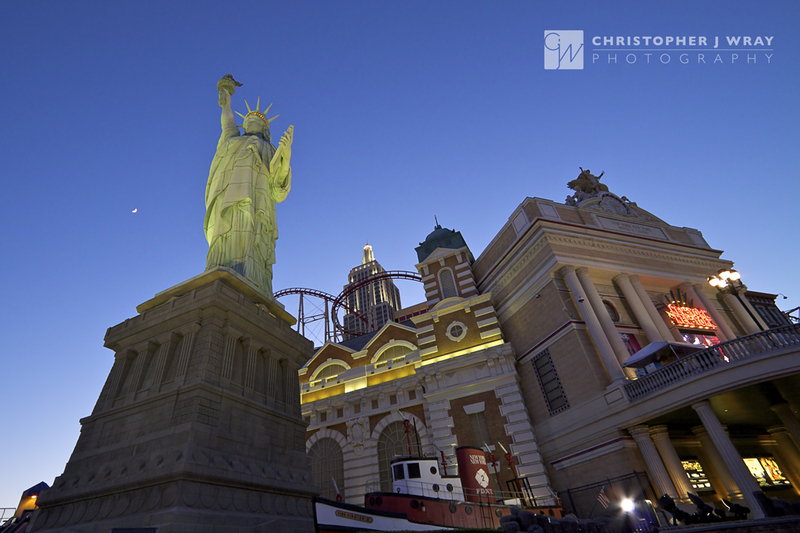 Along the Strip are the 150-ft tall replica of the Statue of Liberty, New York Harbor, The Immigration Building on Ellis Island, and the Grand Central Terminal, albeit crammed together. The signature attraction at NY-NY is the Roller Coaster that lifts you up 200 feet and drops you down 150 feet at nearly 70 mph. The Coaster’s looping course is supposed to simulate a jet fighter’s barrel roll. No, thanks. The bloodcurdling screams were real enough for me! Cool angle, and love how all of the elements look against that beautiful blue sky! You, sir, are a genius.. I just love following your work here online, you inspire me so very much! This shot speaks directly to my favorite photography subject and I think you did a smash-up job of capturing and processing this one, Chris! Top drawer my friend! yeah – nice lines leading the eye from right to left – sweet blue in the sky too. I like that little smidge of moon in the blue sky 🙂 This looks like a mad place, but I’m sure it’s an experience one would never forget!